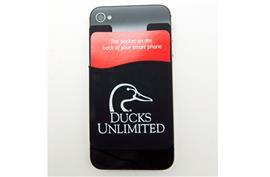 This silicone rubber smart wallet is self-adhesive and affixes to a mobile device or case. 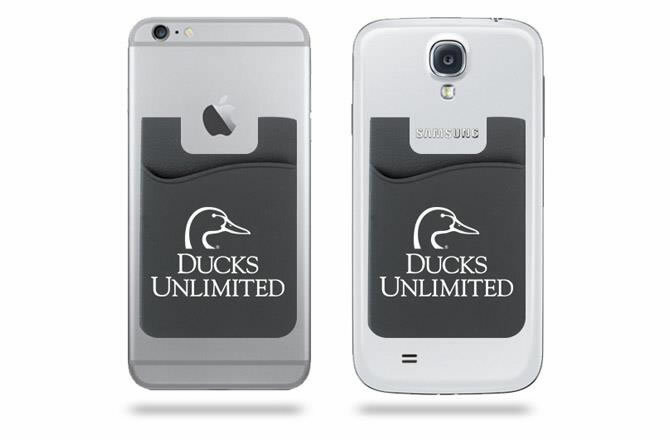 Easily removable, the smart wallet fits most flat backed smart phones including the iPhone and Samsung Galaxy. Measuring 3 1/2 x 2 1/4 inches, this smart wallet can accommodate several credit cards, licenses, or similar sized IDs. It will also adhere to most hard cases. Show your support for Ducks Unlimited today with a tax-deductible donation of $8 or more. Please allow 2-4 weeks for delivery. Measures 3 1/2" x 2 1/4"